Roland "Groupies aren't everything" advertisement from page 33 in International Musician and Recording World Magazine February 1978. February 1978? Seriously? What goes around, definitely comes around. Replace the SH-5 with a new Roland synthesizer such as a Jupiter-80 or GAIA SH-01 and you got yourself an ad that could be slapped into the next issue of Keyboard Magazine. The clothing, the ad title font - everything fits. And that is probably why I'm so hooked on this advertisement. Okay, maybe update the ad copy as well - replace "Genesis and Meal Ticket" with the names of some bands that all the hip kids listen too now-er-days. I've hyper-linked the text "Meal Ticket" to the Wikipedia page just... in... case... you might not be familiar with this London-based country band. Roland might also have thought readers at the time wouldn't know who Meal Ticket was either, because in August 1978 the ad-copy had abruptly changed to "Genesis and Steve Hackett. Much better, Roland. This was an "international" magazine after all. The ad continued to run in IMRW throughout '78 and even early '79. Interestingly, in March 1979, IMRW split into separate UK and US editions, and I found the US version of this ad running once in the April 1979 issue. I doubt Meal Ticket would have gone over well with the US and Canadian audience. 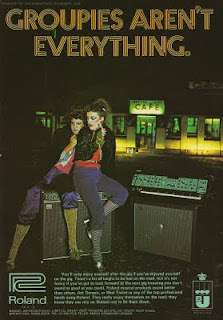 Now, before you start emailing, I do realize this ad is technically not a synthesizer advertisement. But that SH-5 just looks so juicy sitting beside those fine young ladies in their purple high-ride long-zippered pants and fancy socks that I just couldn't resist. Who could? Plus, as I dug more deeply into this ad, I realized just how interesting it actually was. If you look in the bottom right-hand corner of the scan, you will see a cute little logo made up of a crown sitting on a box that has within it three quarter notes and the letters BJ. Growing up in Canada, I can't recall ever coming across this logo - in a Roland ad or any other ad for that matter. But later on in life, as I became more infatuated with synth advertisements, I started noticing it in early European music magazines. And if the BJ logo wasn't visible in an ad somewhere, then the actual name of the company was. Well, no matter, they would need to find another supplier shortly. In fact, the Royal Danish Court *and* Roland would both be looking for their instruments. Seems that Brodr Jorgensen was having difficulty dealing with the increasing strength of the Yen near the end of the 70s, and declared bankruptcy in 1980. According to the article "History of Roland Part 2:1979-1985" found in the December 2004 issue of the always excellent Sound On Sound magazine, Roland suddenly found themselves with no supplier for all of Europe - "one third of their worldwide business". To make matters worse, liquidators had taken control of over a million pounds of Roland gear, and another 1.5 million dollars worth of gear was already shipping to Europe. This would have tanked Roland if boss Kakehashi had not finally found a bank that would provide a credit line. Then, in early 1981, Kakehashi was given the opportunity to buy all of Brodr Jorgensen's liquidated assets, but BJ distributed a lot more than just Roland products -too much for Roland to take. But in the end, Roland was able to get back all of the Roland gear before the world was "flooded by cheap equipment that would have undercut Roland's own sales". "During the period, 1970-1980'ies, the entire musical business environment changed dramatically, when electronic instruments came on the market. Realizing that the basis business of Brødr. Jørgensen would continue to radically change, in 1981 the Management decided to sell off many of the business activities, leaving the company with the production and international sales of pianos." Anyways - close call on Roland's part. And nice save. The whole article is fascinating - a great read. Could you imagine if Roland had tanked before all their beloved gear had made it to market? The 808 would have made it, but the 909, 606, 303, Jupiters, Junos, and everything after would never existed. Gah! This is the kind of scary story keyboard players tell their children in front of a campfire.